Of athlete's foot, champignons, and beer. . . The Kingdom Fungi includes some of the most important organisms, both in terms of their ecological and economic roles. By breaking down dead organic material, they continue the cycle of nutrients through ecosystems. In addition, most vascular plants could not grow without the symbiotic fungi, or mycorrhizae, that inhabit their roots and supply essential nutrients. Other fungi provide numerous drugs (such as penicillin and other antibiotics), foods like mushrooms, truffles and morels, and the bubbles in bread, champagne, and beer. 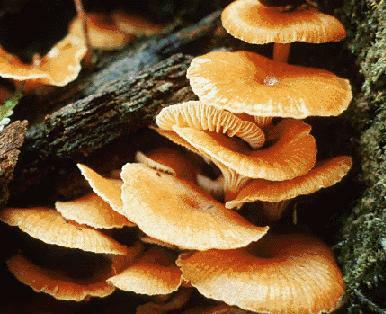 Fungi also cause a number of plant and animal diseases: in humans, ringworm, athlete's foot, and several more serious diseases are caused by fungi. Because fungi are more chemically and genetically similar to animals than other organisms, this makes fungal diseases very difficult to treat. Plant diseases caused by fungi include rusts, smuts, and leaf, root, and stem rots, and may cause severe damage to crops. However, a number of fungi, in particular the yeasts, are important "model organisms" for studying problems in genetics and molecular biology. Click on the buttons below to learn more about the Fungi. Try the Fun Facts About Fungi page at the University of Michigan or visit Mykoweb, an on-line mushroom museum with many nice photos and links. For those with some biological training, try the excellent home page for the Introductory Mycology course taught by Joseph Spatafora. We don't have a large exhibit on fungi. Until we do, may we suggest that you try the images of fungi offered by Tom Volk through the University of Wisconsin-La Crosse. The WWW Virtual Library Yeast Page provides links to sources of information on yeasts, in particular to sources dealing with genetics and molecular biology. We also maintain a list of on-line Mycological and Lichenological Collection Catalogs which you can search for more information.